All this farm-to-table stuff in restaurants these days has renewed interest in heirloom fruits and vegetables. But long before the most recent enthusiasm, there's been a Tennessee gardener who's been on a mission to preserve rare heirloom seeds and to document their heritage. NPR's Debbie Elliott accompanied him on a trek to Louisiana farm country. 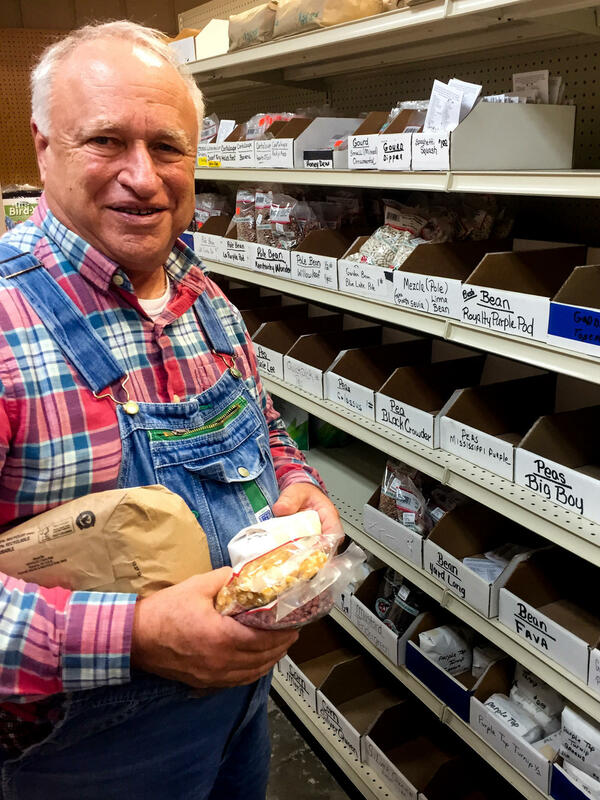 DEBBIE ELLIOTT, BYLINE: When John Coykendall makes his yearly pilgrimage to Washington Parish, La., his first stop is typically the Circle T Feed and Seed (ph) in Franklinton. JOHN COYKENDALL: For me, it's especially the seed. Let's go in and see what they've got this time. ELLIOTT: Dressed in denim overalls, Coykendall heads straight to the back of the store to an aisle of cardboard bins filled with vegetable seeds. He's always on the lookout for rare varieties. COYKENDALL: Only one bag - I'm going to go ahead and grab these. ELLIOTT: Coykendall is like a walking, talking seed catalog. He has a back story for just about every sack of seed in the store. COYKENDALL: Now, this is the Louisiana purple pod bean. It makes a pretty bean - beautiful display growing. The pods are solid purple. But when you cook these, once the steam hits them, they turn green again. ELLIOTT: He's the master gardener at the luxurious mountain retreat Blackberry Farm in his native Tennessee, where world renowned chefs serve up the bounty of his harvest. But his passion is collecting heirloom seeds and their stories. COYKENDALL: Little bit of ancestral history where you're living - where did this seed come from? Did it come from your grandfather or your grandmother? Was it brought here from somewhere else? How do you grow it? How was it cooked? ELLIOTT: Coykendall has more than 500 varieties gathered from small farmers and backyard gardeners around the world. The bulk of his collection comes from the American South, Appalachia and here, rural Washington Parish, La. 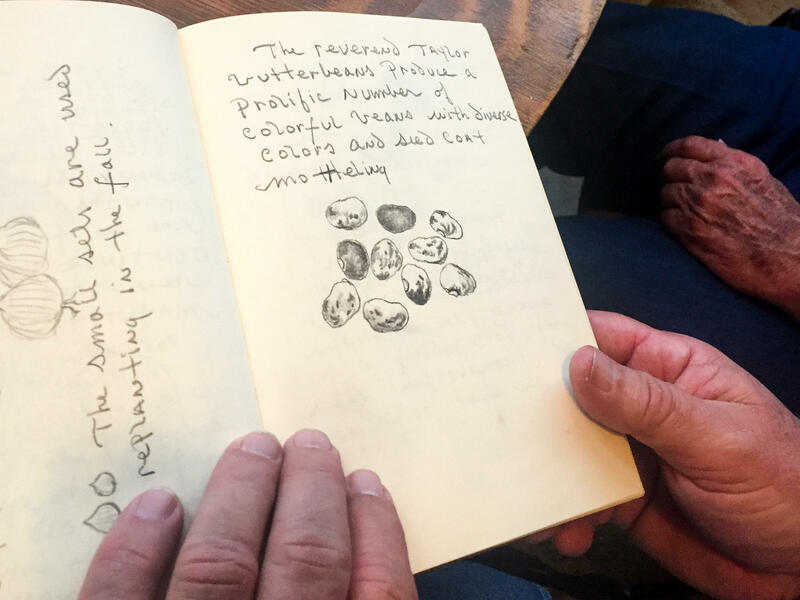 He keeps detailed journals on all of his seed expeditions, something he calls memory banking. He's a trained artist as well as a seed preservationist, so the journal entries include lovely drawings of the seeds, their plants and the surrounding landscape. CHRISTINA MELTON: They're little artifacts, each one of them. ELLIOTT: Producer Christina Melton is helping Coykendall organize his journals into a book. There are more than a hundred of them. MELTON: And it's something that is a real resource for people in trying to re-establish people's ties to the food that they eat. ELLIOTT: Melton made a public television documentary about Coykendall called "Deeply Rooted." It's been circulating for private screenings at Slow Food USA chapters around the country. MIKE LANG: Like we say, John, we ain't never met a pea we didn't like. COYKENDALL: I've always said that. ELLIOTT: Lang lives and plants on what used to be his grandfather's land. Sitting around a table in the sun porch, the men sift through Lang's collection of field peas. He keeps samples of Coykendall's heirloom seeds stored in plastic bins in his freezer. LANG: We save it now. COYKENDALL: If something happens to it now, it's our fault. ELLIOTT: One seed they're saving for posterity is the unknown pea, a prized variety that's been passed down for generations but went missing from local farms for decades. COYKENDALL: The unknown pea of Washington Parish. COYKENDALL: Now - that's it. You know? The unknown pea goes way back in time, probably late 1800s, early 1900s. And they called it the unknown pea because nobody knew where it came from. ELLIOTT: Coykendall says farmers used to plant the unknown pea right in their cornfields, the stalks serving as stakes for the climbing pea shoots. Without even looking at his notes, he can tell you this kind of history about hundreds of seeds. COYKENDALL: It's kind of like having grandchildren. You've got to remember their names. ELLIOTT: The birthdays are when certain varieties gained popularity on U.S. farms. But Coykendall says most of the plants have deeper roots. COYKENDALL: The genetic homeland of the field pea is the Niger River basin in Africa. So they came over in association with the slave trade. ELLIOTT: Knowing the history of our food, he says, is part of knowing who we are. COYKENDALL: And if somebody doesn't record it, put it down, it's going to be lost for all time. That goes for the seeds. This is the living part of it - living heritage, our agricultural heritage. ELLIOTT: Coykendall says the work has grown even more important as industrial farming practices threaten the old farming ways and the biodiversity of crops. Some of his collection is available to growers through the Seed Savers Exchange, a nonprofit group that preserves heirloom crops and stores endangered seeds in an underground freezer vault in Iowa. Debbie Elliott, NPR News, Franklinton, La. Transcript provided by NPR, Copyright NPR.